This structure on Logan Street seems to be staring off forlornly with a look of blank astonishment. When I stumbled across it a while ago, I nearly broke out laughing at how a structure that was undoubtedly once a proud house has been reduced to a state of dumb awe. All done with a few replacement windows and some vertical aluminum siding. What were they thinking? For some strange reason, the house is captivating. Perhaps it’s the complete transformation of a once elegant abode into something completely and utterly offensive to good taste. Then again, the transformation is so complete that it takes on the quality of some bizarre piece of art. It seems only appropriate that the car in front is sitting with a completely flat tire. There’s nothing to report about this house. The image is enough. Maybe we could take the opportunity for a quick caption contest. Prize? That satisfied sensation of accomplishing something witty. Post your caption ideas in the comments. Come on. What’s not to like? It just needs a nose and eyebrows, just like Mr. Potato Head! I think you both figured it out. The house has been reduced to its bare essentials, so much so that it is essentially an emoticon. I wonder if there was any intention behind it or if it just happened by chance. That certainly is a worse example, Karen. At least this one has pretty good craftsmanship. The longer you look at the photo, the more “appealing” the expression on the face of house becomes. Actually, this dwelling may be one of several “rehab” houses that have been established in that area – an area that offends less young families, while offering rather affordable real estate convenient to other amenities. The house does have that strange “appeal” about it that could be brought about by its raw simplicity. It’s also kept neat and clean if nothing else, which could imply some sort of intentional rehab. While it may elevate what could otherwise be substandard housing into a livable unit, if it is a rehab, I don’t see it really contributing to a model applicable to emulation. For me, it’s more of a quirky individual piece of art. The Logan and Shelby Street corridors are one of my favorites in town as they maintain quite a bit of historic commercial architecture and are extremely centrally located. As you pointed out, it’s also quite affordable considering its central location. I found a picture in the BS archives of a similar house somewhere else that has maintained its historic features, and I’ll try to post it online soon as a comparison. I wonder if any of the historic wooden “gingerbread” detailing still exists under the modern aluminum siding on this building. Hmmm. I guess my use of “rehab” was ambiguous. I meant rehabilitation from alcohol and/or drug addiction – a place to find or experience sobriety while reintegrating into the workforce. 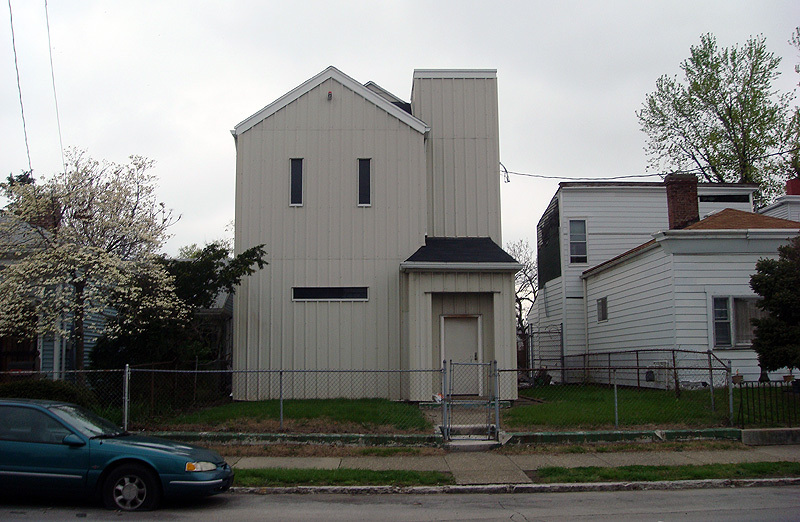 This strange house, with few windows for peering within, may be one of several “healing houses” in the Smoketown/Shelby Park areas.